Chana Masala, or chole masala, is a Punjabi dish that’s most popular in northern Indian and Pakistani cuisine, but is also enjoyed throughout the rest of South Asia. The word “chana” simply means “chickpea” in Hindi and Urdu, and it’s this wonderful legume that is the main focus of this dish. As we’ve mentioned before here, chickpeas are incredibly good for you, being a great source of protein, dietary fibre, folate, and zinc. They’re also low in fat and can help lower cholesterol. Chana masala also features tomatoes, which are good sources of vitamins A, C, K, folate, and potassium, and have been linked to a reduced risk of several cancers. The spices in this dish are quite common in Indian cuisine and all of them boast some fantastic health benefits. Ginger is high in potassium, is great for heart health, and contains silicon, which promotes healthy skin and hair. Coriander (also known as cilantro) is an excellent source of minerals like potassium and calcium, and has powerful anti-inflammatory properties. Turmeric, which has a wonderful heat and colour to it, may prevent the progression of Alzheimer’s disease, helps with weight management, and, like coriander, also has strong anti-inflammatory properties. Cumin is a great source of iron and helps control stomach pain, indigestion, diarrhoea, nausea, and morning sickness. These are only a few of the health benefits these spices possess, and these spices are only a few on the long list used in everyday Indian cuisine. Vegetarian fare, like chana masala, comprises a large part of Indian cuisine, due in large part to Hindu, Muslim, and Jain beliefs. Muslims in India do not eat pork and many Hindu communities consider beef to be taboo, leading to an outright ban on the consumption of it in many Indian states. Jainism preaches complete vegetarianism, in line with its message of non-violence towards all beings. Good chana masala is fairly dry and spicy with a sour citrus note from the amchoor1. Many recipes also include anardana2, though the following recipe does not. In India, it is often eaten with a type of fried bread and is known as chole bhature. It’s also commonly sold by street vendors. Aloo chole is a Pakistani variation made with potatoes as well as chickpeas. There’s also a version in Lahore called murgh cholay that consists of chicken and chickpeas. 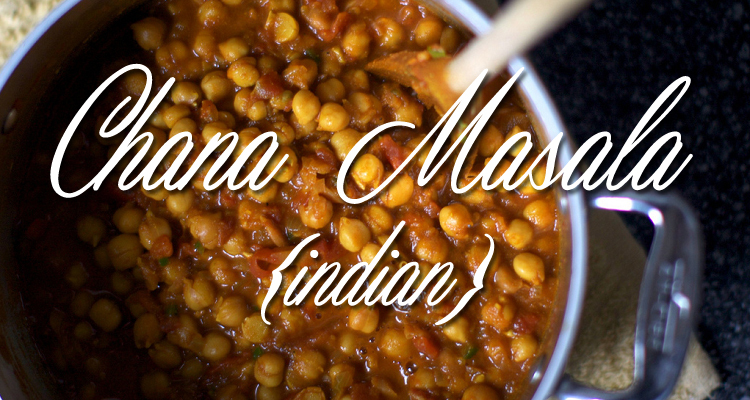 Chana masala is perfectly wonderful on its own or as part of a meal and is great served together with warmed naan3. Heat oil in a large skillet. Add onion, garlic, ginger and pepper and sauté over medium heat until browned, about 5 minutes. Turn heat down to medium-low and add the coriander, cumin, cayenne, turmeric, cumin seeds, amchoor (if using it), paprika and garam masala. Cook onion mixture with spices for a minute or two, then add the tomatoes and any accumulated juices, scraping up any bits that have stuck to the pan. Add the water and chickpeas. Simmer uncovered for 10 minutes, then stir in salt and lemon juice. Eat up or put a lid on it and reheat it when needed. Curries such as this reheat very well, later or in the days that follow, should it last that long. Would you recommend numerous spices of India to be used in this recipe or limit the amount?